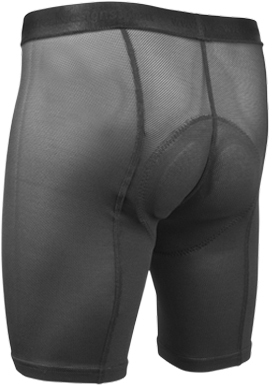 Men's Gel padded cycling underliner bicycling underwear. Mesh Fabric is extremely breathable and cool.Legs stay in place with light elastic. Flatlocked seams are soft and smooth next to your skin. This garment makes a good liner. The fabric stretches all ways to support muscles and offer light compression. Legs stay in in place with light and soft leg gripper elastic. Luxurious Italian elastic materials are soft to wear yet deliver performance for cycling exercise. Wide waist elastic is soft and luxurious, brushed on the inside for softness next to skin. Seams are flatlocked for smooth and stretchy seams. Includes: Men's Elite Gel Air Mesh Chamois Pad is sewn into the inside of the saddle area of the shorts. Best uses are long distances and century rides or bicycle tours where there are long hours in the bicycle saddle. The Italian made chamois pad is excellent for long distance road or mountain bike rides. It has a seamless surface design with a three dimensional combination of foams fitted together like a puzzle engineered to absorb road shock and act like a pillow on the saddle. The fit is anatomically designed with a combination of elasticity and density. This pad tested in the excellent category by our product development team. I've been really happy with these so far. Only worn a couple times and waiting to see how they do on long ride but so far so good. Fit is really good and seems to run true to size. Selected 3x. Worried may be too big. Fit perfectly. Padding is great. Did a 50 k ride no troubles. Very comfortable. Very comfortable to wear. These are by far my favorite to wear. Superb fit for Big Men. If want to enjoy a long ride with ultimate comfort--- This the way to go. I have the AERO TECH MEN'S ELITE. A Great buy. Arnie Watson love these. Works well with the urban knickers. I'm set for spring. Happy to find a place which caters to the big guy. This is my second pair of liner shorts. Great fit and padding. My first pair were my go-to ones. I decided to backfill my others with Aerotech shorts. I love the way the material fits snug but doesn't cut into my skin. I will continue to get my liner shorts from Aerotech. Good job guys. These are comfortable, and the fit is good. The only negative issue I have with them is that the gel padding is a little high in the front for my taste, and gets a little "warm" for me even in the cooler weather. I'd prefer that it be a lower rise and perhaps even shifted back a bit higher on the but. Having said that, I like the shorts and wear them regularly. They do their job well providing a comfortable long ride. Great workmanship. Haven't had a chance to try them out in the heat of the summer. The front pad seems to come up too high. Very well made. When wearing it offers comfortable padding in the right places, and the short is cool to wear. Has more effective padding than other liner shorts I own. Very satisfied purchase. I give them a 5 star because of their great customer service. When I buy something on line I need to know that the seller is going to stand behind my purchase 110%. They do!!!. The products they sell are great and I have bought several. Great quality. Some shorts I fit into a large, some an XL. That's where the great customer service comes into play. Great customer service, great quality. You can't go wrong. I bought 2 of these for my adult children after getting a pair for myself a couple of months ago. We ride hard. We ride aggressively on whatever trail we find ourselves on. These shorts do the job. And we get whatever baggy outer shorts we prefer. Treat yourself, get a pair. I' quite pleased with this product. It's well made and durable. It fits like a glove and dries fast after washing. The padding is even and comfortable. I should get a lot of miles out of these padded liners... underwear... a great value for the price. Perfect quality fit and comfort except the padding comes up too high in front making them too hot! I'm 5'10 175lbs so I bought medium Aero Tech Elite Air Gel Padded Cycling Underwear but they are really full on bike shorts. The elastic on the bottom of the legs was also a bit too tight but once i cut the underlying white elastic bands in half at both ends next to the seams they stopped cutting into me. They are still are grippy enough thanks to the fabric to stay down and the fabric has not unraveled in our washer after making small slits avoiding the seams. Got a pair of these to replace some Pearl Izumi liners that were starting to give me saddle sores on longer rides. Haven't done any real long rides yet, but some moderate length mtn bike rides are showing them to be comfortable. They do not breathe as well as the Pearl Izumis', but the extra padding is noticeable and is working well for the distances covered so far. If they continue to work well I may consider upping to a 4 star, but for the time being they appear to be a workable liner at a decent price. I am using one of the harder Specialized body geometry saddles which gives good sit bone support and keeps pressure off the prostate, but has definitely been painful on longer rides. So far the Aerotechs have worked well on it. I did get a size smaller than normal, and it is a little snug but is so far working well. Order arrived quickly. For the price I would say they are worth trying. 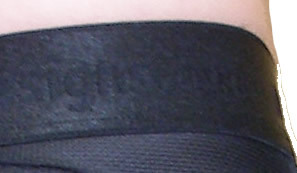 I have been riding with the PI integrated shorts/cycling underwear. I felt the PI liner was always a bit lacking, but I had returned to riding after a lengthy absence, I was unsure. These cycling underwear did make a difference. I just cut the existing underwear from the PI shorts and wore these. There was a difference. Hopefully they will hold up to multiple washes. Material overall is stretchy and very comfortable feeling. Seem placement, however, makes for an uncomfortable experience. This pair of liner shorts is a great value. The padding is generous and and more effective than any of the ill-fitting more expensive shorts I own. Very disappointed. Like wearing sandpaper, chamois too far forward in liner. Purchased these for longer rides, as the thicker chamois looked like it would help. I have been riding for a little over a year, and have been limited to rides of about an hour due to pressure from the saddle. I am about 230 pounds, and have been using simple, thinner padding liners from Trayl. The Trayl liners do not provide enough padding, but are great for wicking moisture and not chaffing. I have never had to use chamois cream or other lubricant with the Trayls, so assumed I could do the same with the Aero Techs. I purchased the Elite Air Gel Aero Tech liners and used them on a 21 mile ride at about 80 degrees. It was apparent after 45 minutes that the liners were not going to be comfortable, as they starting chaffing a lot. This was due to the material of the chamois that is against the skin, it is hot and it is very rough. In addition, the gel pads that are supposed to protect your sit bones are too far forward, as the chamois goes up way past my package in the front and it short in the back. I have a 40 inch waist and ordered the XXL size, so know that they were the correct liners for my size. Given that I spent $60 for these, would have expected them to be of higher quality and comfort. Awsome comfort for the long ride. These liner shorts are the most comfortable shorts I have ever owned. No more discomfort or soreness during or after a long ride. I got a size smaller than I normally wear & the fit was great. I started bragging about them & my buddy bought a pair. It's great that they are made right here in the USA. Thanks for a great product ... well worth the price. I am 6'5" and wear a 44" waist on my jeans. I purchased the XXL and they are perfect, so basically, they do run a little larger than you'd expect. My old XXL shorts from Nash are just a bit snug now, so I was thinking of ordering XXXL but glad I read the reviews first. Have only ridden once but like them so far. Wore my Elite Air Gel padded underwear for the first time today and wish I had purchased them years ago. Finally no pinching between my legs. I did 37 miles with no bunching or pinching. The higher quality padding was very noticeable. I am beyond happy with these bike undies. I'm a large guy, and originally purchased the 1 size smaller than I usually wear, as was recommended by other reviewers, but I actually returned that pair and went with 2 sizes smaller than what was indicated by the sizing chart and this pair fits just the way I want. A great product. I'm a tweener who hates things tight on him so I ordered a large. Turns out I'm definitely a medium with these shorts. Company was easy to deal with and exchange the product ASAP. Tried one pair and ordered another after a couple of weeks of riding. I ordered medium with my 32" waist and found these run a little large, but didn't want to chance too small. These can be worn as shorts as well as under shorts. Very comfortable with no bunching. Thank you.